Winsome protagonists return in this novel that pays tribute to the classic, closed-society English mystery. Donna Fletcher Crow’s affable, problem-solving duo returns in A Most Singular Venture, the fifth volume in a literary suspense series. Scholarly couple Richard and Elizabeth Spencer embark on a London journey in which a slow-simmering, rare private book auction leads to unexpected conclusions. This entertaining mystery pairs a clear passion for Jane Austen’s work with winsome protagonists. The plot is a confluence of three undertakings: Richard’s Queen of Crimes summer university course; Elizabeth’s research for an article on Jane Austen’s London and her close reading of Austen’s letters; and an effort by Richard’s brother, Andrew, to bid on a set of Jane Austen first editions for his publishing company. When a seemingly farfetched murder raises doubts about the auction, Elizabeth’s walking tour—which takes the Spencers to some of Austen’s favored haunts—and Richard’s forays into the Golden Age of mystery writers lead the always lively pair to test the line between facts and assumption. Without direct involvement in the case, the Spencers are uniquely positioned to speculate. Lengthy passages quote Elizabeth, who expounds on Austen. Several scenes detail Richard’s classroom discussions. The back-and-forth movement between their respective jobs creates a tight structure for the novel, though their tendency to lecture begins to dominate the work. Still, the Spencers offer ample material for English literature buffs. Their sections also inspire a fascinating tour of the curious parallels between past and present. The way they each arrive at critical conclusions becomes the main draw. As such, secondary characters appear less examined. These include a woman whose brash exterior belies a shrewder nature; a potential love interest for Andrew, who never leaves the periphery of key events yet remains unknowable; Andrew, who, despite being a suspect, is absent for stretches at a time; and various figures involved with the auction. The murder itself also begins to seem incidental, receding into the background as gradual insights, sudden disturbances, and eleventh-hour revelations add up to a bold finish. With a bibliophile’s flair for language, the author makes London an integral setting. Public buildings are drawn in beautiful detail that reveal both restored and bygone splendor. Elizabeth’s delight in her findings and Richard’s gentle challenges for his students provide warm notes to a cold tale of greed. 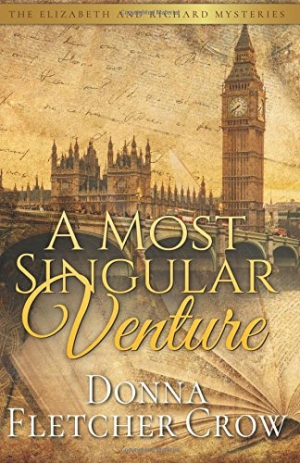 A Most Singular Venture cleverly pays tribute to the classic, closed-society English mystery. Themes of duplicity and subterfuge provoke thoughtful questions on the lies people weave about themselves and the lengths they’ll travel to hide them.